We truly live in the age of the gadget! Everywhere around us there are touch screens, high definition displays and incredibly powerful computers, all nestled in people's pockets or resting in their palms. The never ending development of the gadget is something we've come to expect these days, but with 2015 in full swing, which are the top gadgets that have been, and are going to be, released this year? 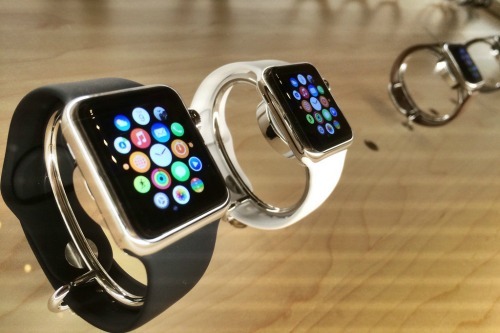 Technology giant Apple's first stab at creating a smartwatch has been interesting in a number of ways. The release has tested the water to see what sort of appetite the public has for watch-based computers - yes we have wearables already, but nothing is as multi-use as the Watch - and although this appetite seems to be rather slight at present, we've been able to see the capabilities of these watches properly for the first time. Initial reviews have been positive, and it'll be intriguing to see where developers tread when it comes to the development of apps for the device. Korean manufacturer Samsung's new smartphone has been turning heads since release, its amazing display and meaty processing and RAM capabilities winning over consumers worldwide who have been yearning for a decent iPhone competitor. The smartphone has truly excelled itself in the realm of gaming; whether you're enjoying casino games, sports titles or combining the two in exciting wrestling themed video slots based on both, the S6 can take it all, and then some! This is an amazing gadget that everyone needs. Period. This new keyboard has a slot that works with any tablet or smartphone (or both at the same time), allowing you to quickly plug in and get typing when you've got a report to write and you can't be bothered with touch screens. We predict that this device will be a huge success. Intel's new technology, whilst not a specific gadget itself, makes technology aware of its surroundings. Drones thus can be made spatially aware - one of the product's main draws - but the technology's abilities also mean that any item outfitted with the system will be able to respond to vocal and gesture-based control. Smart homes will be with us very soon indeed! Solid state drives are the Ferraris of the computing world, able to read and write data at a rate of 480MB/s, tens of times faster than regular hard drives. The G-DRIVE ev SSD takes the tech further, offering customers an external 512 GB drive they can use with any of their devices. Which one of 2015's top gadgets do you want in your home? Tell us below!